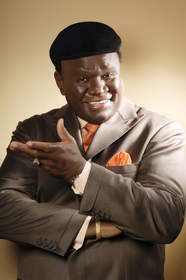 Media Alert: George Wallace Welcomes College Students to "The Best 10 p.m. Show"
George Wallace, headliner in the "I Be Thinkin'" show at the Flamingo, will offer free tickets to college students up to the age of 23 throughout the month of March. Students must show proof of valid college I.D. Additional tickets are available by visiting the Flamingo Box Office, by calling (702) 733-3333 or online at www.FlamingoLasVegas.com. Tuesday through Saturday at 10 p.m.
George Wallace is in his sixth year as a headliner at the Flamingo and has packed the showroom every night with thousands of laughing fans. Known best for his "Yo Mama" jokes and his infamous "I Be Thinkin'" lines, Wallace creates a one-on-one atmosphere with his audiences, including them in the show and giving away a multitude of prizes during each performance. For more information on George Wallace, please visit www.georgewallace.net. George Wallace performs at 10 p.m. Tuesday through Saturday at The Flamingo Hotel & Casino. All ages are welcome. For ticket information please call (702) 733-3333 or visit www.FlamingoLasVegas.com. Las Vegas Comedian George Wallace offers free show tickets to college students this spring break.